It’s all come down to this. HBO has debuted the first teaser for the eighth and final season of Game of Thrones, along with an official premiere date for the show’s long-awaited return. 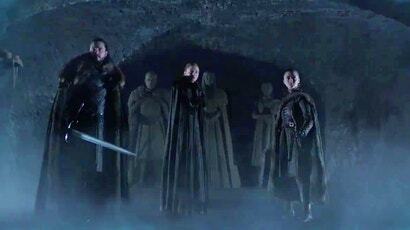 With Westeros standing on the brink of an abyss, it’s hard to say who’s going to emerge from the coming war alive. After spending months teasing us with quick peeks, HBO has finally given us a proper glance at what’s in store for the final season, which premieres in the US on April 14. The teaser chooses to focus on the Starks at Winterfell — confronted with the ghosts of their past, while facing an uncertain future that could very well lead to their deaths. After the White Walkers succeeded in breaking down the Wall separating Westeros from everything beyond, a massive army of the dead is poised to destroy everything in its path. Jon Snow (Kit Harington) and Daenerys Targaryen (Emilia Clarke) might be dedicated to stopping the Long Night, but it isn’t going to be an easy fight. Not only do they have to deal with the White Walkers, but also their budding relationship — as well as the machinations of Cersei Lannister (Lena Headey), who isn’t ready to give up the Iron Throne to a Targaryen just yet. The final season of Game of Thrones may only have six episodes, but each of them is poised to make a huge impact. Not only has director David Nutter confirmed each of the episodes will be over an hour long, but the series will end with what’s being called the biggest battle ever seen on film or TV. The actors have been very hush-hush about what we can expect for the Swan Song of Ice and Fire, but they’ve all agreed on one thing: We haven’t seen anything yet. Game of Thrones returns on HBO April 14 in the US. The Australian premiere date has not yet been confirmed, but we can safely expect it to be fast-tracked.